French Emblems: Emblem: SIMULATION ODIEUSE. Hypocrisis odiosa. Qui fait dissimuler les pensées couvertes. Confit son imposture en paroles disertes. Heureux qui n’a par toy sa raison endormie. Dum parat humano sacra cruore Thoas. Falsus ad aggestas currit amicus opes. Here Pylades rescues his friend Orestes by his own death while Thoas is preparing for the sacrifices with human blood. A sure friend is to be tested in uncertain [i.e. risky] matters, whereas a false friend runs after accumulated wealth. 1. Louis Malarmey, of Besançon, was one of Boissard’s oldest friends from his hometown. He is also the dedicatee in Boissard 1593, no. 32 ([FBOb032]). His brothers are also dedicatees, François in no. 12 ([FBOa012]), and Jean in no. 20 ([FBOa020]). 2. The correct quatrain to accompany this motto and pictura should be the one printed under ‘Amicus certus in re incerta cernitur’ ([FBOa031]). 3. As told in Euripides (Iphigeneia in Tauris), Pylades, son of the King of Phocis, accompanied his friend Orestes to Tauris (the Crimea) to try to escape the Furies (pursuing him after the murder of his mother Clytemnestra). They were imprisoned by Thoas, the King of Tauris, who had a policy of sacrificing strangers. 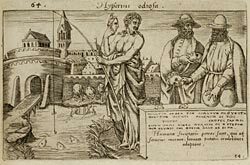 Pylades’ willingness to sacrifice himself for his friend ultimately led to freedom for both (and Orestes’s sister, Iphigeneia).